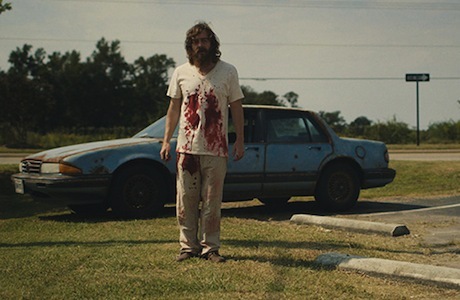 When Blue Ruin opens, Dwight (Macon Blair), a homeless man living out of a rusty old blue Pontiac, scrounges for food at a local carnival, heating up his findings on the beach where he parks and spends his nights. A police officer picks him up, taking him into the station while reassuring him that he's isn't in any sort of trouble. She, as we learn, knows Dwight and his back story quite well, pointing out that she wanted him to be in good company when heard that the man who killed his parents was getting out of prison on early parole. Dwight, in a position with literally nothing left to lose but the titular car, which is deliberately American-made, acting as a metaphor for the country's decimated mythology, decides to enact vengeance on the man. This decision, one that puts justice in the hands of the victim, has a bare bones simplicity that acknowledges and slightly subverts the classic narrative of the country itself, understanding the history of violence and (anti)hero ideation that built the very foundations of a country perpetually running from its own past. Normally, the act of killing would require intricate planning and have to occur at an opportune moment to ensure self-preservation. But Dwight, lacking the skills associated with a Western hero, merely follows the recently paroled murdered into a restroom at a bar and attacks him with a knife while he tries to take a piss. It's ungraceful, brutal and crisp, having an awkward realness and unflinching vividness that exaggerates the ugliness and horror of unrehearsed violence. Though it's graphic, there's nothing gratuitous about what we see; it's just candid and disturbingly real. What gives Blue Ruin its charm is Dwight's believable, entirely plausible, bumbling sensibility. Acting on emotion, he doesn't think about his getaway or how he'll evade detection while covered in blood. His luck, or lack thereof, guides him to his sister (Amy Hargreaves) where he learns that his decision could very well have put her life, and the life of her children, in danger. The cat and mouse games that unfold are as brutal as they are, at times, funny. The mistakes that happen during moments of attack consistently have logic. Director Jeremy Saulnier is careful to ensure that each moment has a sense of banality that ties everything into our quotidian experience, making things like a bow and arrow attack look and feel as out of place in suburbia as it would in real life. Similarly, his handling of character breakdowns has an idiosyncratic frankness that corresponds with the template of shocking, unexpected violence, giving everyone contrary personality traits. For example, Sam (Dwight's sister) initially seems professional and conservative, cooing the sort of blandly concerned sentiments one would when encountering a long-lost sibling with a history of asking for money. But when she finds out what Dwight did, her body language shifts and her vocabulary regresses to a simplistic state of angered vulgarity, suggesting that presentations, whether they be that of character or country, are easily chipped away when violence is introduced into the lexicon. Though occasionally too convenient for its own good, this highly engrossing thriller has the makings of a lasting cult title. It's the sort of text that could easily be scrutinized for introductory American film theory, being accessible and entertaining while also having the vernacular appropriate for its own time and place.